On all DUOLAMP tail lights there is a GREEN wire and a BLACK wire. The metal housing of the tail lamp is the ground. You can ground the housing in two ways. 1. If the housing is coated, take some off the tail light to expose bare metal. That bare metal on the housing needs to touch bare metal where it bolts to your mount. 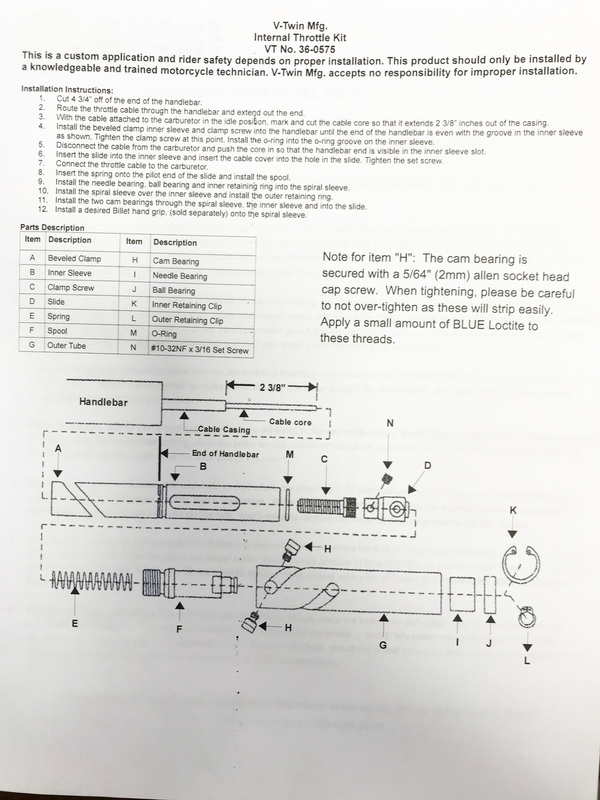 Hydro Clutch 7184 Installation Instructions: byMachinist Mike, Inc.
1) Drain oil and remove primary cover, clutch cable and knock out ramp and roller assembly. Toss that garbage in the trash. NOTE: Save the clutch adjusting screw. 2) Prior to proceeding with the install, it is a good idea to check the condition of a few parts. In order to inspect these parts, you must disassemble the clutch pack. Once disassembled, make certain that the rivets that attach the clutch hub to the clutch shell (clutch basket) are tight and the two do not move or rock on one another. If they do, you can align and tack weld the two together on the back side of the clutch shell. Secondly, there are (6) studs attached to the pressure plate. After years of abuse, they can become worn and grooved. If grooved or worn, we suggest replacing the pressure plate. Lastly, with the clutch pack out of the clutch shell, inspect the grooves in the clutch basket where the clutch plate fingers ride. Again, after years of abuse, these fingers get notched and grooved which leads to poor and erratic clutch engagement. If you notice this, use a file or sand paper to smooth out the fingers and any burrs. After careful inspection of all wear parts, re-assemble the clutch pack. 3) Make sure thrust collar (releasing disc collar) or tamer stays in the thrust collar bearing (releasing disc bearing). 5) In this step you will measure to determine how much you must cut off of the adjusting screw. Take a measurement from the raised 1/16” boss on primary cover to the bottom of the hole in the thrust collar and note this measurement. This is often easiest to do with a pencil or pc of welding wire as a gauge. Place pencil through the primary cover access hole into the tamer. Place a mark on the pencil at the boss on primary cover. The difference in length between the measurement you took and the length of the adjusting screw is the amount that must be removed. Measure twice and cut once! 6) Install adjusting screw and jam nut on Hydro Clutch. NOTE: Use thread lock on adjusting screw nut. 7) Measure from shoulder of unit to the tip of adjusting screw and make it the same length as the measurement you took in STEP 5 minus ¼ turn. NOTE: Make certain you cut the end of the adjusting screw that does not contact the thrust collar. 8) Install Hydro Clutch in primary cover with oil seal O-ring. Thread Hydro Clutch until it bottoms out on the primary cover then back off so the bleeder hole is at the 12 o’clock position. This will aid in the bleeding process. Attach the hydraulic line. Once all fittings are tight from clutch master cylinder to the Hydro Clutch, it’s time to bleed. Use DOT 5 brake fluid. Use Teflon tape or Teflon sealer on bleeder. NOTE: We recommend that you bench bleed the master cylinder prior to installation. Then make sure fluid is coming out of the line at the Hydro Clutch. These steps make bleeding much easier. 9) If clutch drags, unscrew Hydro Clutch and back adjusting screw off ½ turn.